Lucy Cordero was born in Puerto Rico in 1941. She moved to South Carolina with her husband and her three children in 1982. In the following interview, she recalls Charleston in the 1980s and discusses the formation of the Tri-County Hispanic American Association. The organization was a key force behind the organization of the Latin American Festival and helped identify priests to serve the growing Spanish-speaking Catholic communities. Selection from interview with Lucia Cordero by Marina López, 20 November 2013, courtesy of The Citadel Oral History Program, Lowcountry Digital Library. Clip from original interview minutes 16:11-27:15. To access the full oral history and transcript, click here. 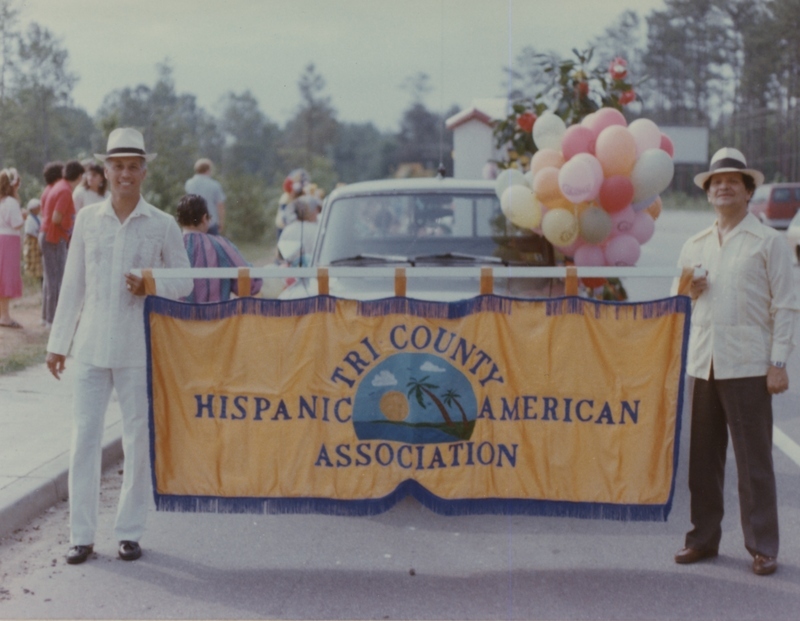 Tri-County Hispanic American Association members with banner, South Carolina, circa 1990, courtesy of Ángel Cordero. Members of the Tri-County Hispanic American Association carrying their association banner. The Tri-County Hispanic American Association was founded in 1986. Marina López: What was Charleston like in 1982? Lucy Cordero: This was a jungle. The very first thing I’ll say is that it was a jungle. ML: What do you mean? ML: The weekend field trip. LC: So, it was good. But we put our youngest son in Divine Redeemer, the church. ML: The Catholic school in Hanahan. LC: Divine Redeemer, the Catholic school, yes. When I arrived, my husband had already registered my son there. The older ones had gone to Trident. ML: To Trident Tech, the college? LC: Yes, to study. At Divine Redeemer, I started spending time with other Hispanics. I met two or three of them, and here in Goose Creek, when we didn’t go to mass at Divine Redeemer, we’d go to church at the base because we lived in the apartments in Red Bank Rd. We’d go to church at the base. I always remember that one Sunday, the lector started reading, and I said, “She has an accent. She sounds Puerto Rican.” When she finished, I walked over and she has become one of my closest friends, Nilda Fowler, from Puerto Rico. LC: Here at the Naval Weapon Station. ML: The one that’s over there in Red Bank near McDonald’s? That church? LC: Yes, that church. That’s where we started. ML: So you’d go there? LC: Yeah, so once I’d met Nilda, I kept meeting, Nilda Fowler, she was married to an American, yes. Through her, she had been here for some years. She had a group of Hispanic friends, so that’s how we kept going. ML: Who were they? Were they also Puerto Rican? What were they doing here? Do you know? LC: There were many. There was one from Costa Rica who passed away. There was a Cuban. They were from different countries. There were some from Puerto Rico; there was a little group—we formed a little group of Puerto Ricans. ML: Were they people who lived in the area? LC: People who lived there, near the Air Force base. ML: They were all people with military connections. ML: We were from different countries, but the thing we had in common was the military. LC: We started with a group of Hispanics until we—the circle we have now. There was a time when there were two groups, the Tri-County Hispanic American Association. ML: It was a different group? LC: We started it ourselves. My husband was the vice-president. ML: Tri-County—can you repeat the name? LC: Tri-County Hispanic American Association. LC: That was in 1988. I think it was 1988. LC: With all those people, there. For that reason, we started to organize Hispanic dances with Hispanic music, with those discos like the ones they used to have. When they knew it was happening, we’d start cooking. ML: You organized parties, social meetings. LC: Yes, parties. That’s when they started joining us. ML: So there were two groups. There was the Círculo Hispano. LC: I got here in June 1982, and by December 1982, I received a letter from the Círculo Hispano inviting me to a Spanish mass. That was when Father [Edward] Lofton from Saint Theresa de Jesus near Dorchester Road. He’s the parish priest. Father Lofton was very young. He had just left the seminary, and he was in Greenville. He’d come to say mass once a month. He read in Spanish but couldn’t speak a word of it. He’d come once a month to say mass in the convent on James Island. ML: The nuns—the nuns who work at Our Lady of Mercy? Those nuns? LC: Yes, well their convent, yes. LC: It’s a very beautiful place, a splendid place. ML: When? So the father said mass. When did you start having mass at Saint Thomas? That was the first Hispanic mass, right? LC: Well, out here, yes, but, as I said, among our group, our circle, we went out there, once a month. We’d take food to share, cook the food, and we’d have a good time, especially at Christmas. It was lovely. In other words, the first two years, I didn’t go back to Puerto Rico. I settled in well here. This year, one of the ones who were always with us passed away. She would even dress up as Santa Claus and brought toys to the kids in the convent. After that, Father Lofton was assigned to a parish and could no longer come say mass. So the Olmeda family had a small shop in Goose Creek. They lived in Holly Hill. There was a priest near there who was a friend of theirs and started to do what Father Lofton did. He was American and spoke no Spanish, but read the mass, so we started having mass at the Naval Weapon Station. We asked for permission and had it once a month. ML: So he didn’t speak Spanish but liked you guys and knew you? LC: The second one, Father Lofton was the same, an American who spoke no Spanish, and Father Lawry was the same. He didn’t know Spanish but read the mass in Spanish. My husband has a video of it. On the Feast of the Epiphany, we’d celebrate together with the kids. We’d gather toys and give them away. It was fantastic. Those were very good years. ML: Was what you did meant to help those with military connections or did you start to expand? LC: We opened up to anyone who wanted to join us. We were there. ML: How did that happen? How did you spread the word about your group and contact outsiders? LC: People would tell one another, “look at these guys. They have parties. The Hispanics are going to do this,” and that’s how we spent our time. The group mainly met in different houses every weekend. We’d play dominos and eat traditional food. I don’t know if you had a chance to meet Maria Bloom, the Cuban lady who had a huge group here. So we were more or less making, like I said, I was with Tri-County, but I was also with the Círculo. I participated in both groups. We did that for a few years. ML: Did the two groups unite or did Tri-County disappear? LC: No, Tri-County unfortunately—those in the military were transferred to other places. So the group weakened. In fact, the Hispanic festival held in Wannamaker Park was organized by us, Tri-County. LC: We created it. The first one was in the park on James Island, James Island County Park. They leant us the space. ML: Do you remember when this was? LC: That was, I think it was 1988, in the summer of 1988 around there. We had three or four on James Island. Then when Wannamaker opened, the woman who was over there, Susy, who was our good friend, brought us over here. We brought the festival over to Wannamaker, but like I said, people kept leaving, transferring because of the military. There were only four couples left, and my husband said, “No, I can’t keep going with this.” The other man said the same, so we dissolved Tri-County. 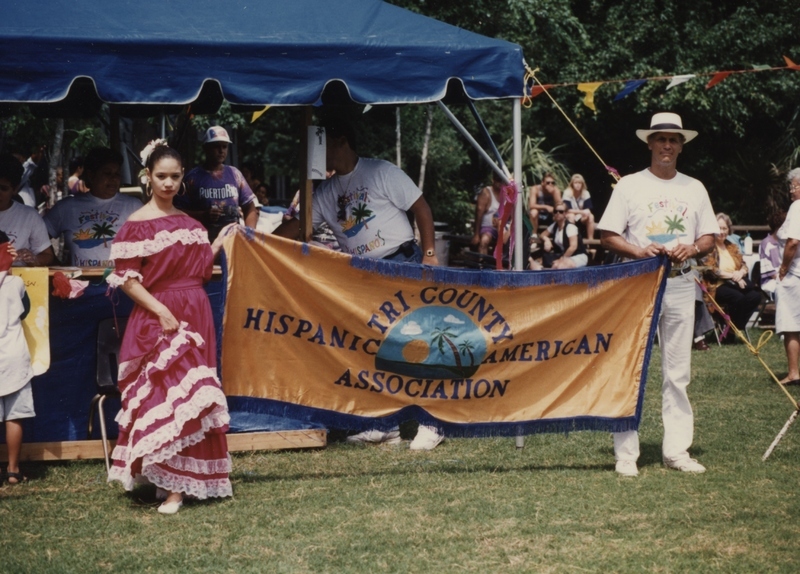 Tri-County Hispanic Association at the Hispanic Festival, Charleston County, South Carolina, circa 1990, courtesy of Ángel Cordero. Members of the Tri-County Hispanic Association carrying their group's banner at the Hispanic Festival.